The folks at DiGiorno contacted me to see if I would be interested in trying their new Pizzeria! Pizza. Since pizza is my favorite food, I said "YES!" DiGirono sent me coupons for two free pizzas. The Pizzeria! pizza comes in 4 varieties: Quattro Formaggi, Italian Style Meat Trio, Supreme Speciale, and Primo Pepperoni. I chose Quattro Formaggi and Italian Style Meat Trio. First up was the Quattro Formaggi. It was actually really good. It only took 18 minutes in the oven and we had pizza for lunch. We loved all the different cheeses and the sauce was really good. This got 2 thumbs up! I will definitely buy this again. It was my favorite of the two we tried. Next we tried the Italian Style Meat Trio pizza. We both really enjoyed this variety as well. I really like the genoa salami - you don't usually find that on a frozen pizza. I love how quickly the pizza cooks up. It only took 20 minutes in the oven. We both liked the crust. It was crispy and crunchy on the outside and soft on the inside. It wasn't too thick and tasted really good. I would definitely recommend keeping one of these pizzas on hand for a quick lunch or dinner. It is as good, if not better, than most delivery pizza. 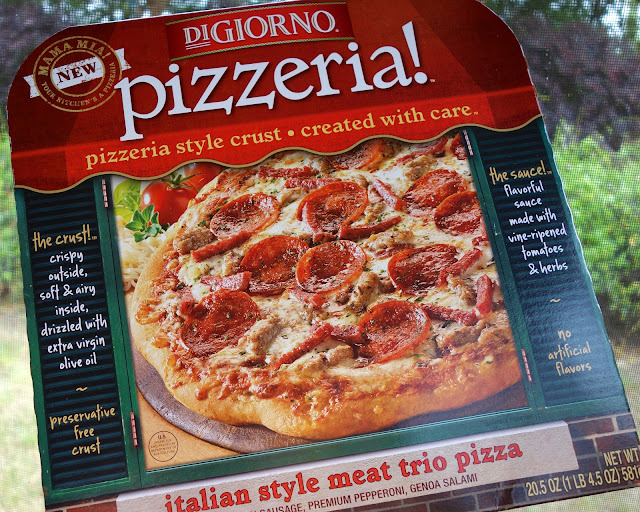 DiGiorno is giving 5 lucky Plain Chicken readers 2 certificates for free pizza! The contest ends on Friday, May 17th @ 11:59PM. The winners will be contacted by email and have 48 hours to respond. If winners do not respond within 48 hours, an alternate winner will be chosen. Good Luck! Wow, this is hard to choose, I love all kinds of toppings! Lately I am really liking pineapple! I'm not picky. As long as there is cheese and sauce I'm open to whatever else is on top. Yum! Would lovve to win! You can never go wrong with pizza, and the more cheese the better! I love veggies on my pizza, but if I have to appease my hubby, pepperoni is required too. My favorite used to be sausage but now it's bacon. Thanks for a yummy giveaway! Bacon, Pepperoni, or Extra Cheese! Would love to try them all! Lots of cheese and bacon... Yummy! If I could only have one topping on a pizza, it would be Pepperoni for sure!! YUM! 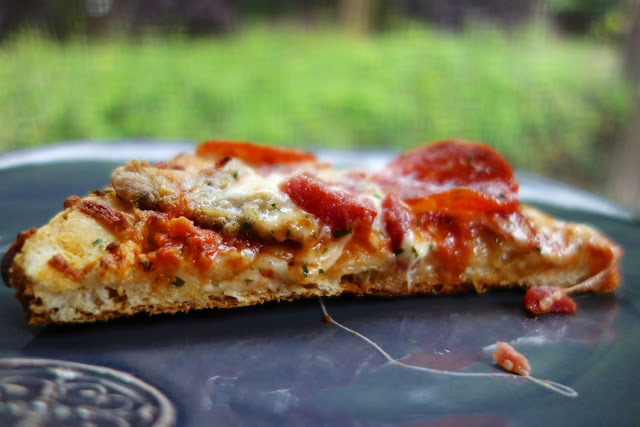 I love DiGiorno Cheese Stuffed Crust pizza and would love to win so I could try this version. Thanks for the opportunity to win! I would have to say pepperoni is my favorite but I like most anything . Cheese and sausage are my favorite toppings. I like sausage on pizza best.. Does it have to be just one topping? I like fresh tomatoes, onions and green pepper... yum! I love supreme, loaded with lots of great ingredients! I love mushrooms on mine! I like mushrooms or pineapple. I would have to say mushrooms, followed by italian sausage. I'm a pepperoni lover, but when feeling heathly will do veggies with lots of onion. Pepperoni is always put on our pizza! I love everything on mine. My husband loves mushrooms. i tend to be pretty simple. i love different cheeses on mine. papa john's 6 cheese is awesome. i also like bbq chicken and bacon. Canadian bacon & mushrooms! But I love any kind of pizza ! But DiGiorno is my favorite. Haven't tried these yet. I love cheese and black olives. So yummy! Bacon and jalapenos are always great together! I love any type of sausage or chicken pizza. I love roasted red peppers on pizza too! My favorite pizza toppings are ground beef, black olives and mushrooms. I do love a supreme style pizza with all the goodies on it! I like artichokes on pizza. Love mushroooms on my pizza! I love pizza with lots of fresh veggies. I am also quite a fan of Hawaiian pizza! I have always loved Pepperoni since I was a kid but lately vegetable is currently my favorite. BTW I love your blog! Love think, crispy pizza crusts! Will definitely look for these at my store. My favorite topping is 4 Cheese.. I'm so plain, but man.. Cheese is goooood!!!! Hands down, pepperoni is my fave! Pizza is one of my favorites! I like pepperoni & black olives. Thanks for the chance to win! I like pineapples on my pizza. olives and pineapple is my very favorite. yum!! I have had 2 of the supreme pizzas and they are fabulous! The best I have ever had. The onions are in larger pieces so that you actually get the flavor, and the crust is amazing. The seasonings are also very tasty. Love!! My favorite pizza toppings are black olives, spinach and grilled chicken...a hands down winner! I love Capacolla (spicy ham) from my local pizzeria. Second fav is pepperoni. My favorite pizza is Pepperoni with pineapple. Mushrooms and onions are my favorite pizza toppings. I love chicken on a pizza. We love these pizzas. They have just enough kick so that our 5yr old likes them! Our favorite is the cheese! My favorite toppings on pizza are pepperoni, ham, bacon, and sausage!! Real bacon is our favorite pizza topping. My favorite topping is canned mushrooms! Grilled chicken, tomato and mushrooms! I love any kinds of veggies, but my favorite on a pizza is mushrooms, onions & banana peppers! MMMMMM! I love all pizza but especially pepperoni! My favorite topping is pepperoni thanks for the chance to win. My current favorite is pepperoni and black olive. Now I'm craving pizza! Pizza is hubby's favorite food, he could it three times a day! OOPs. Pepperoni is the favorite in this house. Extra cheese! Well done please!!! my favorite is the Supreme Pizza...I love the meats and all the veggies!!! Yummy!!! Veggies and lots of cheese. Di Giorno is the only frozen pizza I buy. My favorite pizza toppings are pepperoni and pineapple! pepperoni, beef and extra cheese are a our go-to choice anywhere we eat! love pizz! I love onions on my pizza, although onions with bacon would be my favorite combo!! the more meat, the better! 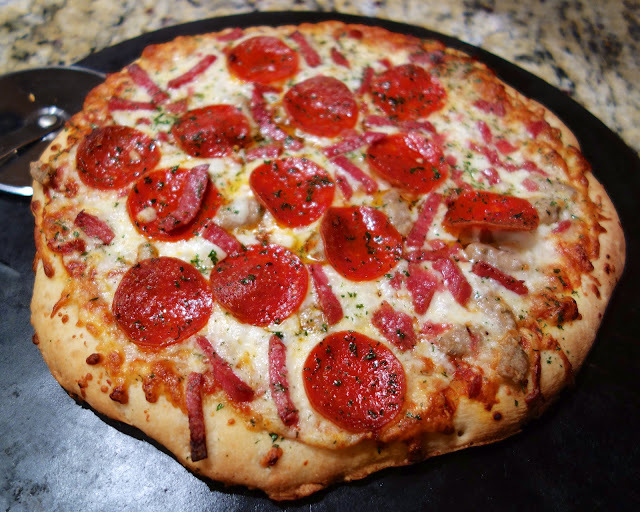 I love bacon on my pizza, with hamburger or sometimes just a simple, yummy pepperoni! I love mushrooms on my pizza! Pepperoni and cream cheese YUM!!! My favorite pizza topping is pepperoni. I love plain cheese, or mushrooms and extra cheese. I would love to try the pizza with salami on it, sounds great! I love, Love, LOVE pepperoni! Does extra sauce count as a topping? If so, it's definitely my favorite! My favorite pizza is bacon cheeseburger with extra cheese. I know this isn't just one topping but it is my favorite lol. No sauce. Lots of cheese. Black olives. I LOVE them on pizza. I usually go for Pepperoni and Mushrooms! But I do like crazy exotic pizza as well. I could eat pepperoni pizza every night of the week. I love sausage on my pizza. I LOVE meat pizzas! I've always been a fan of pizza - how can you not be?!? But I've never found a frozen pizza I like, so I'd love to try these out! I love pizza with everything on top and usually when ordering I have extra green olives and bacon. I also really love pineapple and Candadian bacon pizzas. Cheese, cheese, and more cheese (and mushrooms). Wow those pizzas look yummy... My fav pizza is sausage and banana peppers. Boy has that changed over the years! Used to be pepperoni, lately ground beef with black olives and jalapenos. I love mushrooms and onions on pizza! I'd love to win some free frozen pizzas! oops. 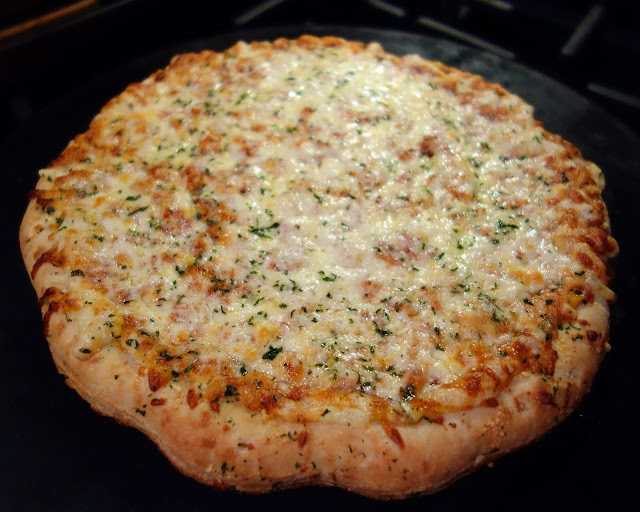 favorite pizza topping... caramelized onions or roasted garlic! I LOVE pepperoni and black olive! I love either cheese, or pepperoni, depending on my mood that day! I love onions, hamburger and olives. Love your blog!! I'm a purist and prefer mine with just cheese. Cheese! I love cheese on pizza. Mmmmm. I like sausage and green peppers on mine. I love canadian bacon,onion and green pepper! Cheese. All kinds of cheese! Ham is my favorite topping. One of my favorite combos is chopped ham, black olives, mushrooms and sausage. Not healthy - but so good! Green Chili is one of my favorite toppings for pizzas. If I had to pick just one, I'd say pepperoni. I also love green peppers, pineapple, onions, and sausage. I love cheese & veggie pizzas best but pizza in general is a favorite food! I had one the other day with chicken & instead of red sauce it had garlic butter. Yum! I'm a fan of your classic pepperoni and sausage pizza!!! I love pepperoni and green olives - meaty & salty! Im boring but its pepperoni all the way! I love the salty goodness of it and pizza without it just isn't the same for me! I love my pizza with jalapeno's! Would love to win to be able to share the new pizza's with my kids. Looks delicious! I love pepperoni and mushrooms. I love mushrooms and black olives on a pizza! Yum! 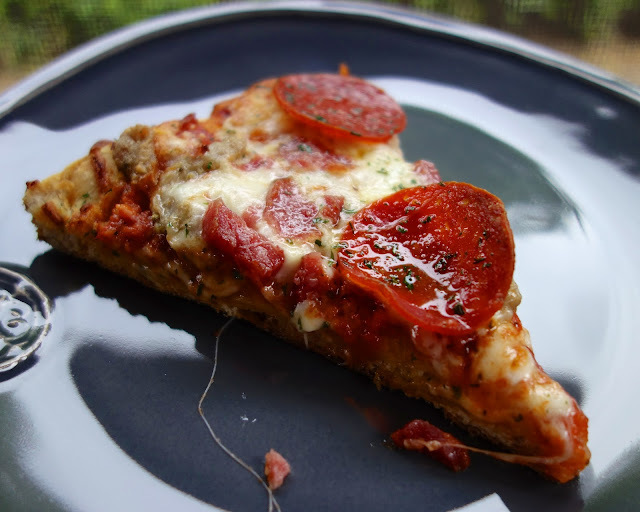 There are some I like to try from time to time... but PEPPERONI is my tried-and-true favorite. I love love love pizza. I'm the type of person who will eat any kind of pizza, but when it comes down to picking my own I'll almost always go with a cheese pizza variety. Hmmmm, P I Z Z A! I love me some Pepperoni, but really I love pizza so much I will eat just about anything! My favorite pizza toppings are ham and pineapple. I can't get enough! 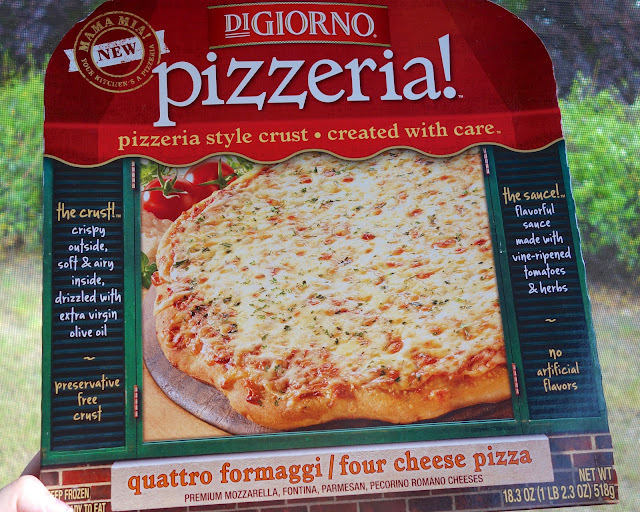 Friday is pizza night in our house and we almost always have DiGiorno! I love pepperoni and olives! Bacon and black olive, I only get it when my husband is away! My favorite is Hawaiian pizza!